Do you tend to have a love/hate relationship with big, green salads? Maybe veering towards the hate side? 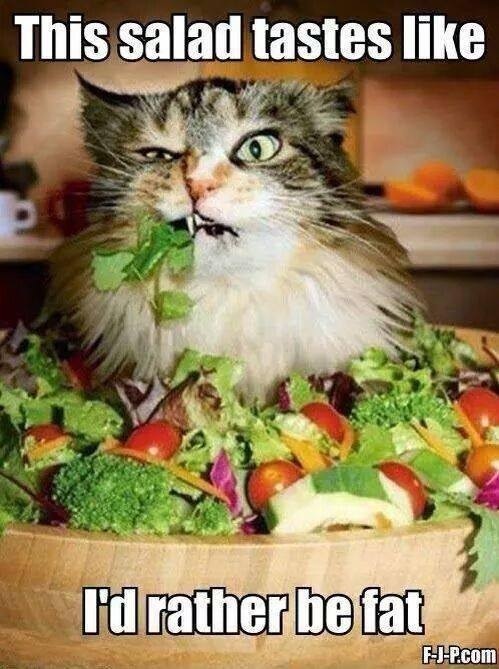 Like when you’ve decided you’re going to start eating healthier, and you proudly choose the salad option instead of the big, greasy cheeseburger with those sweet potato fries that you love so much. But you secretly really want the burger. You’re still looking forward to eating something that will make you feel good and hope this will help drop a few pounds in time for summer. But when your salad comes to the table, you’re staring down at a bowl full of half wilted leaves, a few measly julienne carrots and a handful of tasteless cherry tomatoes. Feeling deflated and disappointed in your choice, you choke it down while adding too much salad dressing. Day after day, you continue to choke down similar lifeless salad bowls because that’s what it means to be healthy, right? I do believe I’ve found that kind of satisfaction…in a salad. Who would have thought? There ARE salads out there that actually taste good! 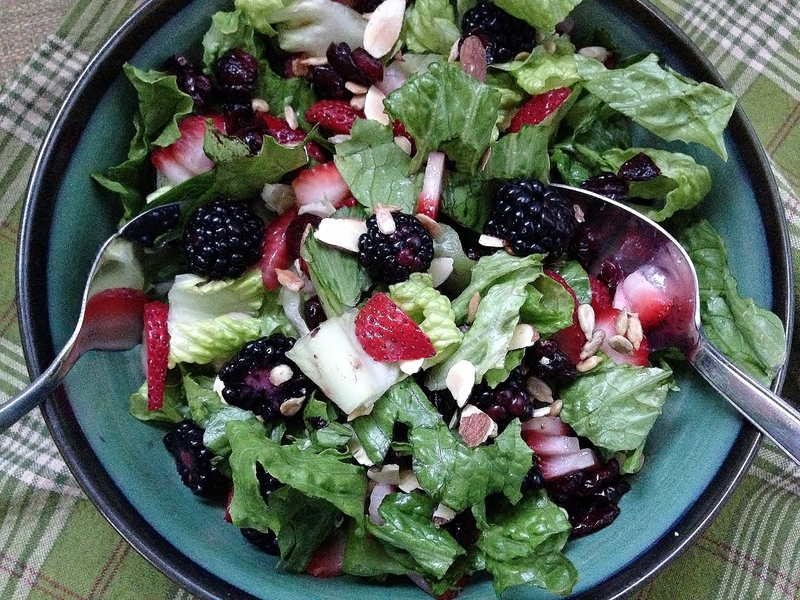 This “triple threat” salad, as I like to call it, features chopped romaine lettuce, sliced organic strawberries, luscious blackberries, dried cranberries, roasted sunflower seeds and slivered almonds. It’s topped with strips of chicken breast baked with fresh thyme, then drizzled with a simple, tangy balsamic vinaigrette. Sweet and salty, yet light and refreshing – perfect for a gorgeous, sunny afternoon. It’s probably one of the best salad bowls I’ve ever laid my hands on. This salad is just what you need sweeten your plate, making you look forward to lunch time, every time. Care to have a change of heart yet? Preheat the oven to 375°(F) / 190°(C) and season each side of the chicken breasts with the salt, pepper and thyme. Drizzle each breast with a little olive oil and place inside of the ceramic dish. Bake for 15 min uncovered, and 15 min covered. While the chicken is cooking, prepare the remaining salad ingredients. Wash the lettuce and pat dry with a paper towel. Place the romaine lettuce horizontally on the cutting board and slice the lettuce into strips, approximately every half inch apart. Place leaves into a large salad bowl and set aside. Hull the strawberries (remove the stems), and slice lengthwise to make thin slices. Toss those into the bowl with the romaine lettuce and set aside again. Then, take the blackberries and cut them in half, and toss those into the salad bowl as well. Add the dried cranberries, roasted sunflower seeds and almonds to the bowl and use your hands to mix the salad together again. Next, you’ll want to prepare your balsamic vinaigrette. Use an empty mason jar, or any jar/container with a lid and add all the vinaigrette ingredients in the order listed above. The key to this dressing is to make it to taste. If you think the honey will make it too sweet for your tastes, you can omit it, or use a smaller amount. At the same token, you can always add more. The same idea goes with the other ingredients. You can also add some fresh herbs if you’re feeling a little more adventurous. Once you have it adjusted to your taste, put the lid on the jar and give it a nice shake. Voila! Instead homemade vinaigrette. When the chicken is done baking, let the breasts rest for a few minutes before slicing them into strips. 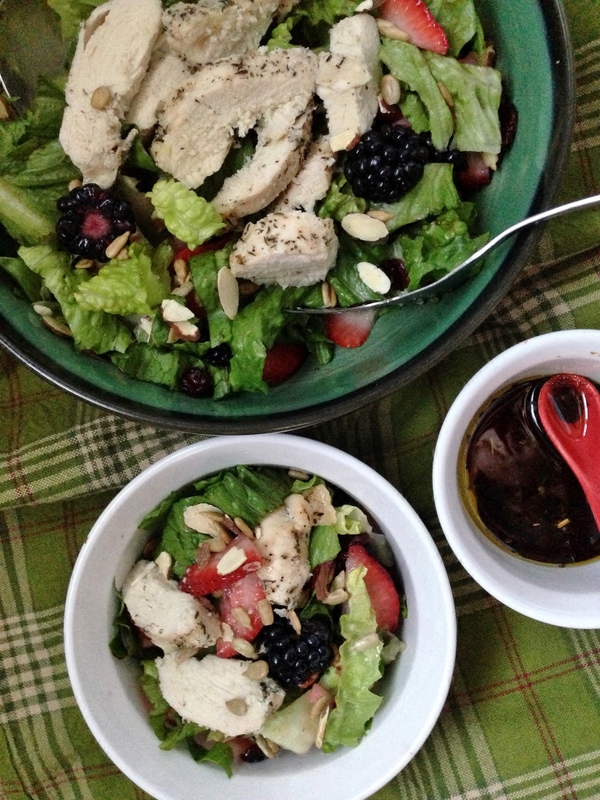 Then, place the strips over the salad and serve with your homemade balsamic vinaigrette. I bet this would be great with some feta sprinkled on top as well! I hope this changes your mind about salads. The trick is to find food combinations that make YOU happy and your body healthy. That just about wraps it up, folks. I hope you have an awesome weekend with sunshine and good food! 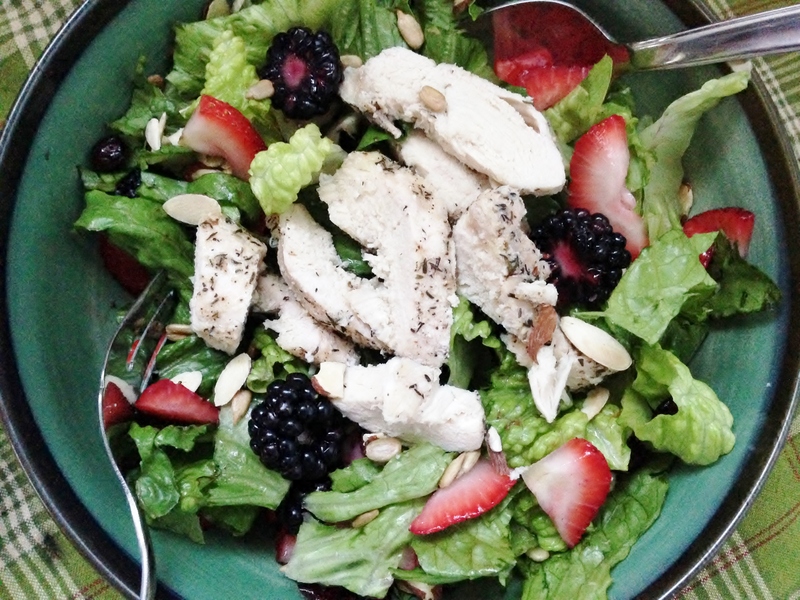 Mmmm chicken and berries are my favorite combination in a salad! Oooh, love this combo. Yum!